Commissario Brunetti’s rash actions in an interview lead to unforeseen consequences and the detective is left facing what he wants from work. Eager to escape the confines of the Questura he takes two weeks leave, escaping to the villa of a relative of his wife. There he plans to row and to read. He befriends Davide Casasi, the caretaker of the villa and the two spend days out on the Laguna. But during a storm Davide goes missing and when tragedy strikes Brunetti is compelled to find out what happened. There is something wonderful about reading the latest book in a beloved series. And sitting down to read Earthly Remains was a treat I savoured and devoured. Try as I might I couldn’t eek out reading the book and I soon found myself racing through it. It is always a joy to return to Venice and to be again in the company of Brunetti and his family and colleagues. It feels like revisiting old friends, catching up with what they have been doing since the last novel. Brunetti is the anti-thesis of the stereo-typical fictional detective. He is happily married, still in love with his wife after over 30 years together. He has a stable family and a network of friends. He likes his job but is aware of its pitfalls – in particular his boss, Patta and his sycophantic side-kick Scarpa. He is not afraid to bend the rules and is more than belligerent towards the state of the politics and bureaucracy rife in Italy. He is also well aware of the limits of the justice system and that some things don’t always work out for the best. In Earthly Remains the story is much more focussed on Brunetti and indeed for the first third of the book the narrative is focussed on him away from his role as police officer. 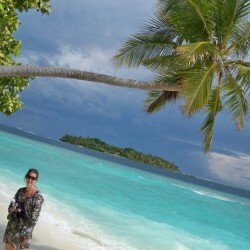 It is also a pleasant change to see him out of his comfort zone by not being surrounded by his family and friends. It was interesting to see him function without Paola, his support network and it was even interesting to see him fend for himself and cook meals, though not the grand affairs usually provided for by Paola and which may the reader wish they were invited for dinner. The prose conjures up Calles and beautiful vistas. I could imagine the hoards of tourists wandering the bridges and canals and see the clear waters of the Laguna away from the city. Venice is very much a central character in these novels and so it is the case in Earthy Remains. The way of life, the battling with the heat and with the rising waters of the Aqua Alta. The beauty of the city is never far away, sometimes fading into the background then suddenly thrown into focus. This is book 26 in the series though it can be read as a standalone. I love the series and would recommend that if you like this novel you go back and read the series from the beginning. The series is very much character based and part of the appeal of the books is watching the family and friends age and develop stronger ties. Much like real life there are not always happy endings, or endings that tie up nicely. There are what ifs and unsettling situations, conclusions and abruptness. But there are also points where truth does out and where love rules supreme, again, much like reality. 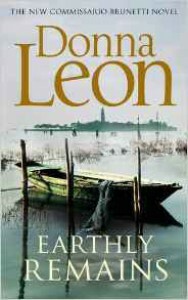 As is often the case with Donna Leon’s novels Earthly Remains is more than just a crime novel. It is a social commentary on the state of politics, of corruption, of human nature and in this instance a commentary on the environment. It examines what humans have done to the planet, their self-righteousness in doing so and also their despair. Donna Leon’s novels reflect the true nature of life. There are not always happy endings, sometimes justice isn’t served. Don’t expect everything to be rounded off, to be completed. Because life isn’t always like that. But do expect to be transported to a beautiful city, to meet a variety of characters ranging from wonderful to exasperating, to read about crimes that are sometimes tragic, sometimes perhaps more well deserved and to be entertained. Because sometimes life is like that too.